The 2015 Intermediate Championship League was decided at Cambridge on the 1st November. 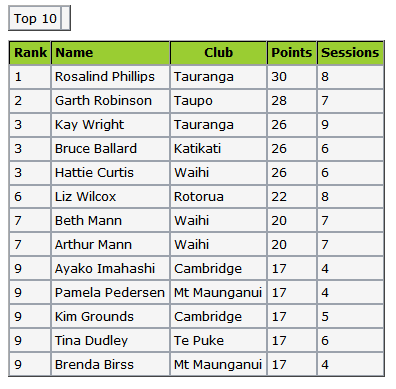 The 9th and final round saw good results for some of the top runners with Rosalind Phillips having to do no better than 9th to become the 2015 Waikato-Bays Intermediate Champion. Rosalind's partner for all but one event of the series, Garth Robinson from Taupo came a deserved second two points behind on 28. Well done Kay Wright for also being the only player to play in all 9 rounds of the event.